My yard has been a nightmare for me. It was a "fixer upper" as much as the house... with one major difference: I couldn't fix up the yard myself. Even if I could withstand long hours in the sun, I didn't have the physical strength or the equipment required to do the work. I would have to hire someone. To my surprise, hiring someone turned out to be extremely difficult. When I wanted smaller jobs done, landscapers considered it not worth their time. I'd tell them my budget, and they'd practically laugh in my face. Later, when I'd saved up enough money to have major work done, landscapers didn't take me seriously; either they didn't believe I had the money, or they didn't believe I would be willing to spend it on a small, older house. Everything I tried backfired. I found one landscaper willing to take the job; he used the cheapest materials and did a horribly sloppy job. I had a tree planted; it was too close to the house and caused the basement wall to crack. I hired someone to mow; he decapitated half the sprinklers. The situation caused me immense distress. I'd look at the yard and want to scream or cry (or both). It was a huge problem I could not solve, and it kept me up at night. FINALLY, after three years of searching, I found a landscaper who seemed trustworthy and who took me seriously. He agreed to take the job, a complete overhaul of the entire yard - front, back and sides. It was a tremendous amount of work. He and his helper worked 10+ hours a day for 16 days. The end result? An outstanding job! I'm pretty picky, and the result exceeded even my expectations. Finally, I can look at my yard and smile instead of crying or screaming! And here are some before and after pictures of the back yard. The amount of lawn was reduced to about one third, which will save hundreds of gallons of water every year. Much of the yard is pea gravel, which is easy for my small dogs to walk around on. Finally, I decided (more or less) what to craft for this month's Outdoors theme - a bird feeder. Or maybe a bird bath. Or a bird house. Something to do with birds. I thrifted a large, tall candlestick which I think will make a good base for a bird bath. So I'll probably go with bird bath. Look for my completed project post around April 28. 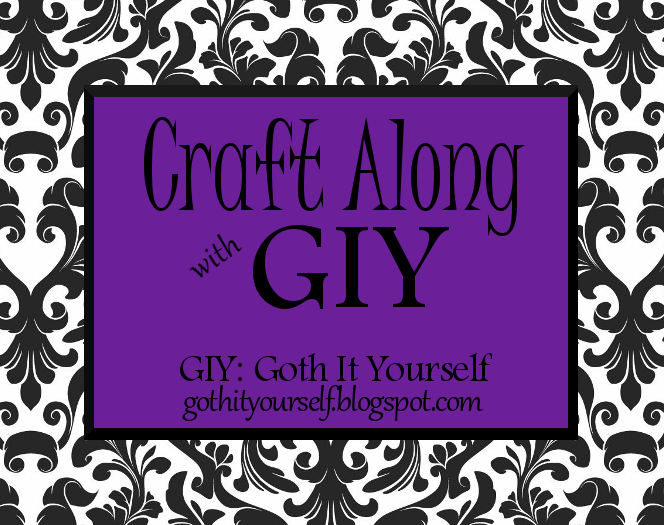 Want to join the craft-along? You can find more details in this post. As with most things IKEA, the curtains are cleverly designed. They accommodate at least three different methods of hanging: rod pocket, back tabs, and loops for curtain hooks. Alas, the pocket and tabs were too small for my large-diameter curtain rod. This left me with the loops. I would need curtain hooks to go through the loops, and curtain rings to hang the hooks on. This was not an ideal scenario for two reasons: large curtain rings are surprisingly expensive, and I didn't really want the look of visible rings. It occurred to me that shower curtain rings would be large enough to fit on my rod... but how would I make them work with the curtain? Then came the "eureka" moment. I realized a particular type of shower curtain ring - thin metal, hinged so that it opens wide - would work perfectly. And they're inexpensive; just a few dollars got me two packages of 12. Using them was simple. Open a ring and slide it through a loop on the curtain. Close the ring. Repeat, spacing the rings appropriately. Slide the rings onto the curtain rod. Done! 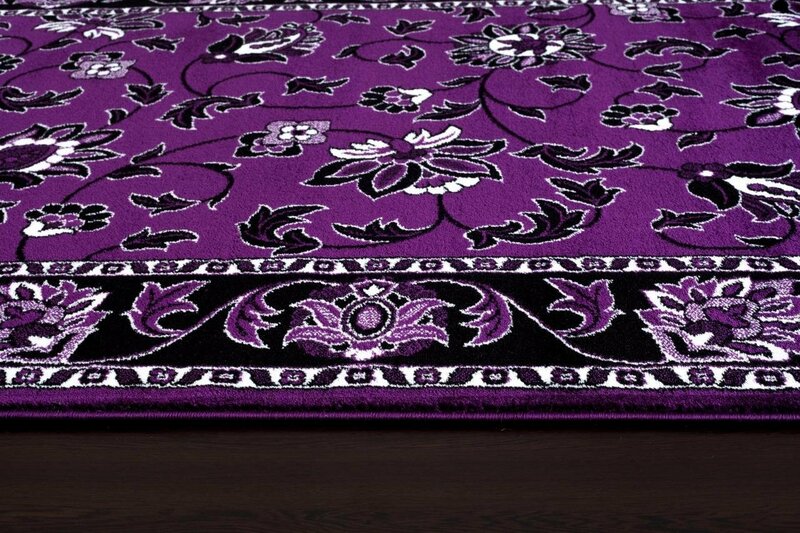 While looking for a rug for my walk-in closet, I was surprised to come across an oriental style rug in black, white and purple. 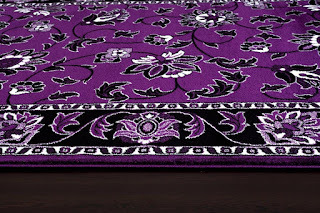 It's more reddish purple instead of my preferred bluish purple, but still gorgeous. I love it! As I mentioned in my last post, addressing the issue of my incredibly irritating creaky floor is going to require major effort... which may not be entirely successful. I decided to solve two small problems so I could bank a couple of wins before moving on to the big battle. First, the cup holders in my car. Each cup holder has a foam disc at the bottom. Once in a while, the foam sticks to the bottom of the cup as I lift it out. Sometimes I don't notice, and later I find the foam disc on the floorboard or in the garage. Well, at some point, the inevitable happened - the foam fell out somewhere other than the car or garage, and I couldn't find it. I used the remaining disc as a pattern to cut two new ones. I used a bright color rather than black. While black is my first choice for most things, in this case, color made more sense. Black foam in the dark bottom of a black cup holder in a black interior with black carpet had been too easy to lose. Second, the remote control for my workroom lamps. When I press the ON or OFF button, the little red light flashes. Well, "flashes" isn't really the right description. The little red light shoots a blinding laser beam directly onto my retinas. Seriously, I don't know how that teeny, tiny light could possibly be so intense. I tried putting black tape over it, and it shone right through. The solution was a tiny, glittery bat sticker. It's hard to see in the photo, but there is a black "gem" in the center of the bat. It's thick enough to block the eye-searing laser beam. My house was built with an unfinished basement. At some point (around 1978, based on the orange shag carpet and brown paneling), the previous homeowners made an attempt at finishing it. They built two walls to separate the basement into individual rooms, and added electrical wiring. Then they apparently abandoned the project and just left everything there for nearly 30 years. When I bought the house, I came into possession of this time capsule from the '70s... along with some hidden problems. The biggest problem lurked in the homemade walls. The walls looked innocuous. Crooked, sloppily made, and ugly... but not harmful. I removed the drywall and doors, but I left the studs in place because live electrical wiring was attached to them. A few months ago, I noticed that some of the studs were bowed, as if they were bearing a lot of weight. This alarmed me. I had a structural engineer evaluate the situation. The conclusion was that the soil beneath the house had expanded, pushing up on the concrete basement floor. This, in turn, was causing the improperly built walls to push up on the floor joists above. The walls needed to be taken down as soon as possible. I needed an electrician to move the wiring before I could remove the walls. In the meantime, I sawed through some of the studs to relieve the pressure on the floor joists. The floor in my living room/dining room began to creak. With the upward pressure gone, the floor joists settled and the subflooring loosened. So as I walk across, the subflooring moves up and down. The nails move in and out of the wood, creating the most horrible sound... a VERY LOUD sound as unpleasant as fingernails on a chalkboard. The creaky area is huge, and it's in the main living space where I'm constantly walking. It's so bad, it creaks even when my seven-pound dog walks across. Several days ago, the electrician rewired the basement, moving all the wiring off the studs. I spent this past weekend removing the walls. They were surprisingly easy to remove... mainly because they were not attached to anything. They were simply wedged in between the concrete floor and the floor joists above. The walls had been jammed in so tightly, some of the floor joists were scraped and dented. It was the perfect example of how NOT to build a wall. I thoroughly enjoyed taking the cursed walls down and was very pleased when nothing remained but a pile of wood. Unfortunately, I still have the creaky floor to deal with. I spent hours in the basement shimming and gluing the floor from below, but it's too far gone for the usual remedies. I will have to pull up the flooring and fix the problem from above. That will be difficult and time-consuming, and I'm not sure I'll be able to successfully re-install the flooring. Those stupid walls have caused me more frustration than any other problem in my house. Time for a new craft-along! 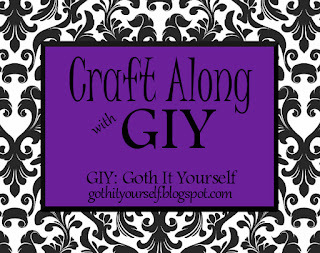 During April, I will work on a craft project for the monthly theme. Around April 28, I will post my completed project. You can share a link to your project on that post or at any time during the month on this post. 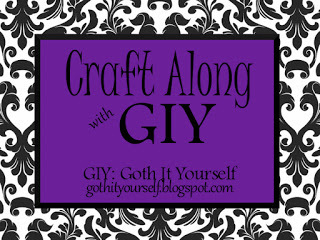 On April 30, I will compile the links on the Craft Along with GIY page. The theme for April is that goth clubwear favorite: Khaki Pants. I'm kidding! Just a little April Fools' Day joke. ;) As a survivor of several years of Catholic school dress code, I want nothing to do with khaki pants. I'm not sure what my project will be... probably something for my back yard as I am FINALLY having landscaping done. :D More on that later.